Why juice and smoothie papayas when you can curry them? I like using nouns as verbs now. Papaya curry is not new to me- my grandmom has been making the same thing for years now. 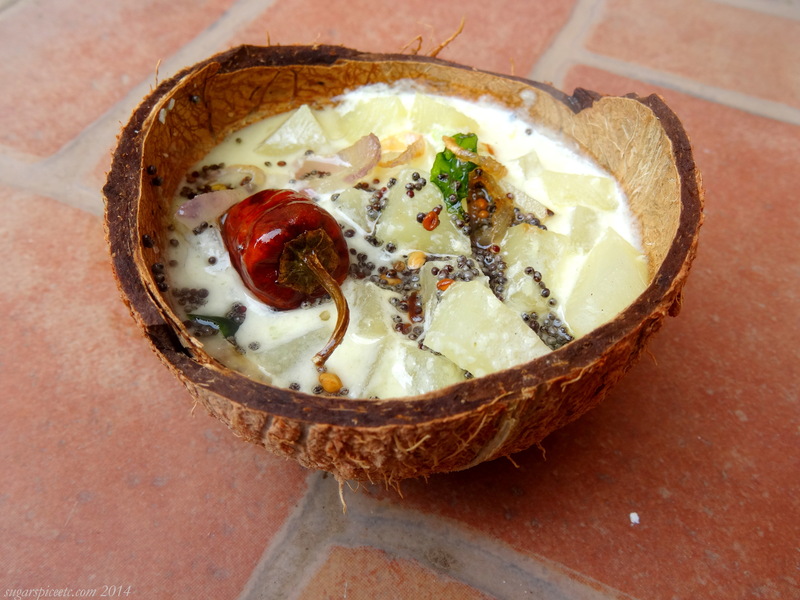 Kapalangya moru curry… but for the uninitiated, it shall be called raw papaya curry. This recipe comes from Ritu Dalmia’s friend Prima Kurian, who is a home caterer. When it comes to food from home, I usually just call my mother, grandmother or mother in law and ask them how to prepare it- I don’t usually read a recipe. But with this one, I followed it to the T, just to see how it would differ from the versions I’d been making so far. Turns out, with the addition of 2 ingredients, the curry transformed. It hadn’t struck me before, but the version my grandmother makes is saatvik: without garlic /onions in the body and tempering. Not that we follow a saatvik diet, I guess it’s just how she preferred it. In a blender, make a fine paste of the grated coconut, garlic, turmeric and green chillies. Add a few spoons of water if you need to. Add the paste to the yogurt and whisk so everything is well combined. Steam the papaya or cook it in water till tender but firm. Add the papaya to the yogurt mix and cook this over low heat for 10 minutes, till the papaya is cooked through, stirring continuously so the curry doesn’t curdle. Pull off heat. In a small frying pan, heat the coconut oil. Add the dry red chillies, the mustard, fenugreek, cumin, sliced shallots and curry leaves and allow everything to sputter. Pour this temper over the curry and serve. Yes I remember Ammuma making it! And no veggie should be overcooked for thoran- that would be a sad thoran indeed! I have never cooked with Raw Papaya. In my mind, it was always a meat tenderiser. After reading this recipe, I am curious about how it will taste. It’s actually nice, not sweet like one would expect- kind of like ash gourd/malabar cucumber, but more tender. I sometimes make thoran with raw papaya too!